The new state-of-the-art location of The Nash Institute for Dental Learning in Charlotte, N.C., is an excellent setting for dentists and dental team members to learn. Our top-notch instructor list begins with Nash Institute co-founders, Dr. Ross Nash, D.D.S., F.A.A.C.D. and Debra Engelhardt-Nash. Throughout their numerous speaking and consulting experiences, the Nashes have traveled to cities throughout the United States, Canada and beyond to educate dentists and their teams about the latest advancements in cosmetic dentistry and practice management. These travels have helped them form extensive networks of professionals who are learned in all aspects of the dental industry. 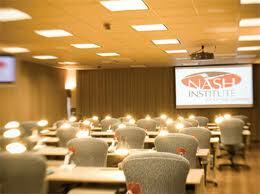 Many of these professionals will be teaching from time to time at the Nash Institute. Real World Marketing That WORKS! We routinely update our course schedule, so please check this website to see what courses are available and who the instructor will be. If you are interested in signing up for a course, please contact us today. If you would like to have Dr. Ross Nash or Debra Engelhardt-Nash come to speak with your group or organization, please contact the Nash Institute @ 704.766.0025 or use our contact form.